Hometown: Born and raised in NYC, been living in Los Angeles for decades (New Yorkers, please don't hold that against me). Favorite Credits: Directing the US premiere of George Tabori's Theological Farce, MEIN KAMPF - a comic meditation on Hitler's days as an artist living in a flophouse in Vienna. The play got me out of serving Jury duty once. During Voir Dire, I simply mentioned the name of the play I was directing, and that was the end of that. My second favorite project was developing, directing and performing in several productions of the Actors' Gang long-running hit musical, KLUB. I describe it as A Chorus Line meets No Exit. Klub is the place where old showfolk go to die. Washed up child stars, suicidal mimes, wanna-be vaudevillians and more, all forced by the director (me) to audition for the chance to escape from Klub (Spoiler alert--you can never get out. Ever). It's funny and sad and a statement on our obsession with celebrity culture. 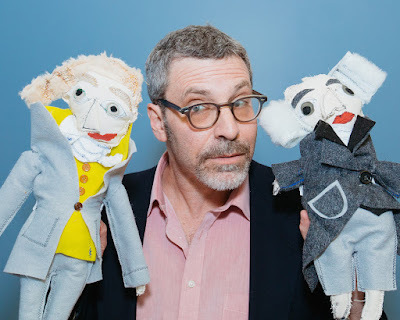 Tell us about Patriot Act: I describe the show as everything you'll ever need to know about American Democracy in just 47 minutes...plus puppets! It's essentially the story of how we, as a nation, have tried to put our aspirations into practice, how we've so often failed, and how we need to keep trying or perish. Could that theme possibly be more timely, during the most insane presidential election cycle of our lifetime? A large part of the show involves audience engagement, so it changes a lot with each performance. The goal is the create a fun and thought-provoking forum about the state of our nation, to get people to step out of their pre-conceived political mind-sets and to start thinking about how they can engage the democratic process in new enjoyable, and productive ways. What inspired you to write Patriot Act? : I'm a lifelong history geek and political junkie. The original idea for Patriot Act was to see if I could tell the story of America onstage within a fixed time period. So I started working with an audience and a timer. I found that it's intrinsically entertaining for an audience to watch a performer fighting against time. I decided to take the show on the road during the presidential campaign, and lucky for me (and you), stumbled into an election cycle for the ages. What kind of theater speaks to you? What or who inspires you as an artist? : I love theater that makes me laugh, but also asks big questions; plays that cut and and aren't afraid to open some wounds. Beckett, Chekhov, Brecht and Shaw are all favorites. I was incredibly inspired by Dario Fo's "Accidental Death of An Anarchist". A few of my favorite artists working today are (running the gamut) Romeo Castellucci, Tim Etchells of Forced Enterainment and Justin Vivian Bond of Kiki and Herb. If you could work with anyone you’ve yet to work with, who would it be? : George Sanders is not a theater artist, but I would looooove to develop a piece of theater with him. His work is dark, hilarious, thought-provoking and aways infused with deep compassion--everything I aspire to create as an artist myself. What show have you recommended to your friends? : Not that I'm being original here, but I think The Book of Mormon is the best American Musical of the last 50 years. It's so smart and subversive and incredibly warm-hearted. That's quite a tough line to straddle, and they do it brilliantly. Who would play you in a movie about yourself and what would it be called? : A movie about my life would be a total "sell-out" project, so it would have to star Brad Pitt, Matt Damon or someone else with serious box office mojo. The movie would probably be called "I CONFESS," since I am all about full disclosure all the time. If you could go back in time and see any play or musical you missed, what would it be? : Of course, I'd love to see the original performances of any Shakespeare play. I also wish I'd been to the world premiere of Jarry's UBU ROI. When the first words of the play were spoken "merdre", the audience went berserk, tore out the seats and general pandemonium ensued for nearly half an hour. Things settled down and the second words were spoken, "merdre" again, and the audience went nuts again. I'd like to be present at any theatre performance that elicits that powerful a response. What’s your biggest guilty pleasure? : Religious television (I used to regularly record Jan and Paul Crouch's "Praise the Lord" on TBN. If you weren’t working in theater, you would be _____? : Historian, journalist and/or politician. What’s up next? : When I work on a project, I am "all in". Period. As this play is part of a larger advocacy project, I am very curious to see where it will go after election day.